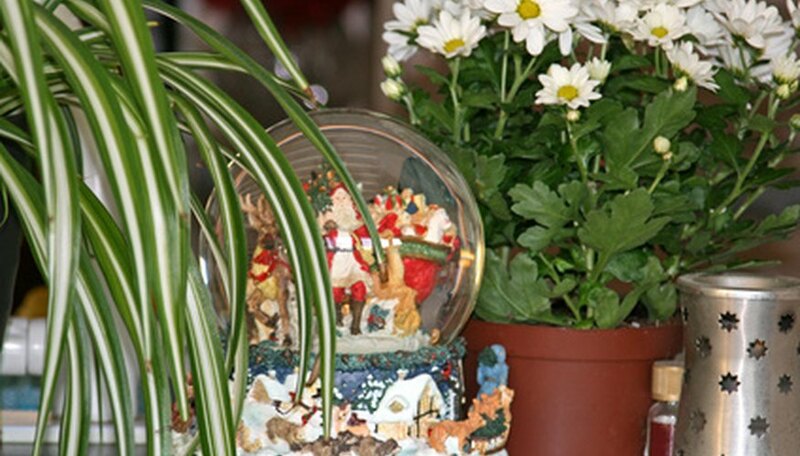 Snow globes can be fun to make with children or for Christmas presents. Personalizing them with an item in the middle can make them very special for you or the recipient. This is also a good project to use as part of a science lesson regarding the solubility and insolubility of certain solvents and solutes. This project uses items easily found in your home or the local grocery store and is relatively inexpensive to make. Pick out a jar or container for your snow globe. The lid of your jar or container will need to fit tightly so it will not leak. Canning jars or baby food jars work very well. Clean the jar and lid with hot water and soap, then wipe them down with rubbing alcohol. Allow the jar and lid to dry completely. Glue your figure to the inside of the jar lid. Allow it to dry while you put together the liquid formula. Put enough mineral oil or vegetable oil in the jar so that it is about three fourths full. Pour Epsom salt into the jar until you decide it has enough "snow." Make sure the oil doesn't overflow from the jar. Line hot glue around the inside of the lid. Immediately place the lid, with figurine attached, on the jar. Again, make sure the mineral oil doesn't spill out. If it looks like it is going to, pour some of the oil out first. Tighten the lid and seal the outside of the lid with a line of hot glue. Allow the glue to dry before inverting the jar. If it leaks, add more glue to the leak. Continue this process until it does not leak anymore, then shake the jar to produce the snowing effect.